This blog has been going for nearly a year now. What started as a tentative dip of the toe has now become part of what I do and integral to my business. Ultimately though, if I want my blog to achieve something for my business then I need to be able to measure its impact. The question is what to measure? But what was being read? Was December a better or worse month than say September when I had 485 views? Or August when I only blogged once? How do I compare month on month? How do I gauge engagement? On their own, absolute views are in my opinion limiting and tend to lead us to view quantity as the objective rather than quality. So what else should we measure? I’m at an early stage with this but I‘ve been using a set of monthly measures to keep an eye on what seems to be most important. Here are some alternative blog measures & personal observations that I hope you find interesting. What I’ve found is that increasingly my blogs readers are taking time to read posts from previous months. This is wonderful and I want to take account of this in my blog stats. For me, this starts to indicate something interesting and different is happening with my blog readers. I would have missed this if I’d not taken time to track these statistics! 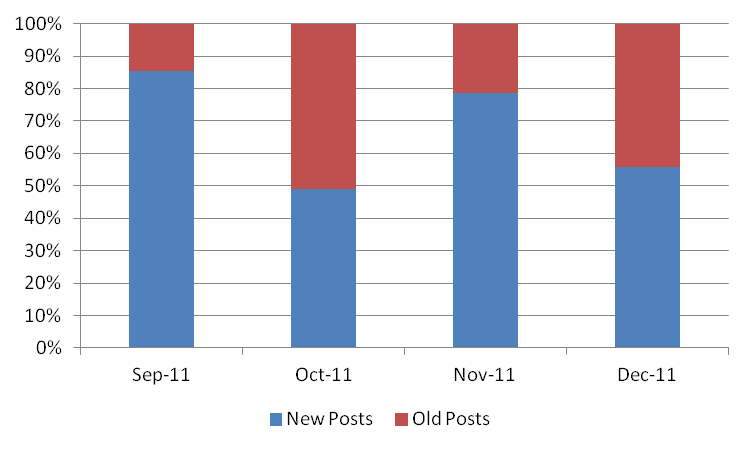 The number of views an individual post receives is relevant, but we all know that some posts are more of a hit than others. My blog is still developing but it’s great to see a steady and continuous trend upwards. It also helps combat those fears and insecurities of a single post that didn’t attract the usual interest! I write my blog both for reflection and for engagement. So to receive feedback in either the form of a twitter reaction or a comment is wonderful. Sometimes, a blog post sparks a fire and the comments rush in. Sometimes there’s a deathly silence or silent appreciation – you choose! 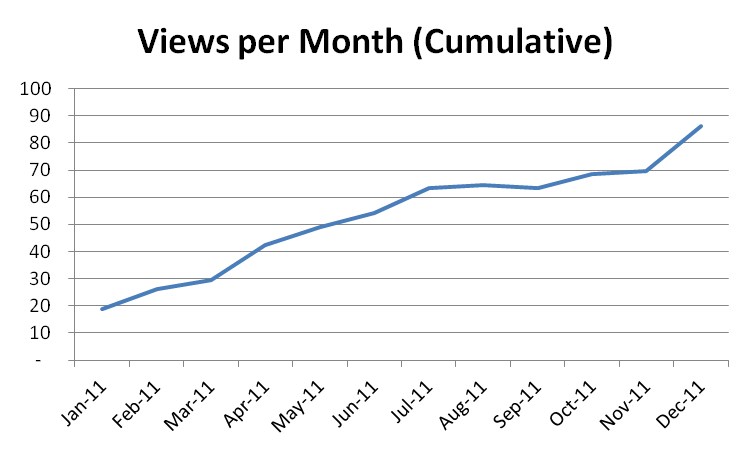 Analysis of the blog statistics is useful but it is just a monthly gauge I use to check in on progress. Perhaps more fundamental are the other perspectives I’m becoming aware of. On a qualitative level, I’m noticing that the posts that generate the most interest are typically edgy/challenging or community focussed. They also generate more thought and dialogue. Expect more of this from me! In terms of audience, perhaps unsurprisingly 2/3rds of readers are in the UK and Ireland and seem to be the most actively engaged (i.e. ready to comment or react). Unexpectedly, a quarter of readers are US based and there is a growing following across Europe, Russia & Asia. This is making think about how UK centric my writing focus is and whether it needs to change. I’ve also realised that there is an unnecessary separation between this blog and my company website. This is manifest in the web statistics. I’m still exploring options but I might end up embedding the blog in the website. There’s something to be said for having everything in one place! Perhaps I’m learning the hard way but thought I share these experiences with you. I hope you’ve found these interesting or even useful. Would love to hear your thoughts! 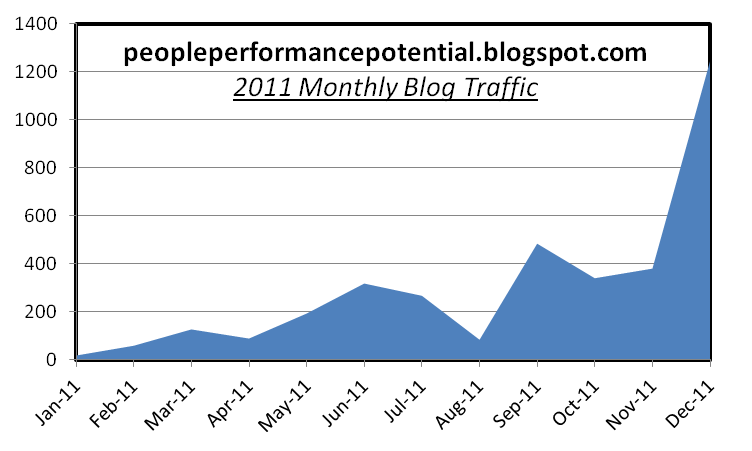 What are you planning for your blog in 2012? What measures are you using to gauge impact & engagement? It's a really good point you make about the range of posts being viewed on any given day. I find that most days I now get visits to the blog, even if it's a handful because of people searching for various things. 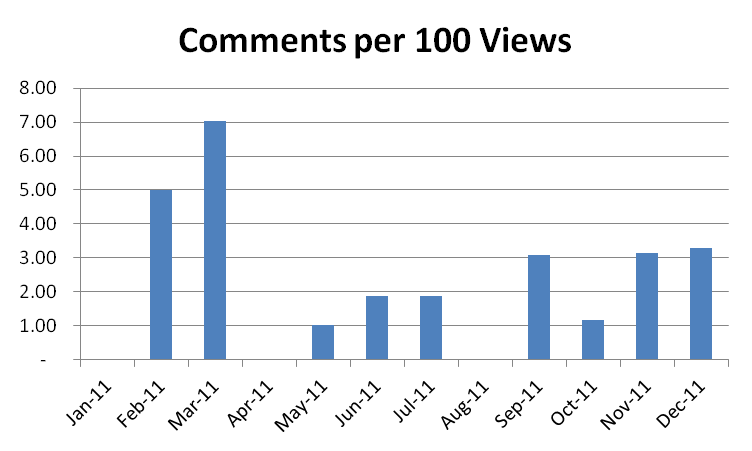 On the days I post something, I can be misled in thinking the total views are due to the post, but have also learned that there are a lot of views happening on older posts too.I also really like the comments per 100 views methodology. It looks like a very useful way to measure activity and I'll give that a go myself. Hi John – great to see you here and thank you for adding tothe thinking!For me there is both personal and a commercial aspect tothis. When I blog, I’m committing mythoughts and experiences to writing, sharing them and hopefully learning morefrom the experience and from any interactions. Those interactions either here or on Twitter also build engagement &relationships.From a commercial perspective, if that is your intention,then I agree you have to see results directly or indirectly. Being active on twitter and blogging has expandedmy business network and provided business opportunities – so yes it’sdelivering revenue.I think though there is a warning in all of this and it’svery much linked to purpose… If you don’tknow what you want to achieve then I think it’s easy to create noise and wastetime. If you are clear on your purpose and know why you blog/tweetthen you’ll spend the appropriate amount of time and curiously it won't be "noise". Blogging needs an investment of time but that’swhat it takes anyway to learn, engage and build relationships.Not sure that's "the" answer but that's my experience!